Dunoir Fishing Adventures, LLC fly fishing guides: Bighorn River, Green River and Wind River. 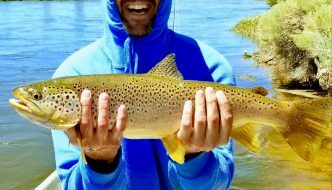 Guided fly fishing trips out of Thermopolis, Lander, Fontenelle and Dubois, Wyoming. Specializing in guided fishing trips on classic western rivers, streams and mountain lakes. 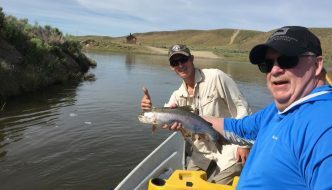 Personable, professional and local guides with over 30 years of fly fishing and guide experience on Wyoming's waters. Our guides live in Wyoming year-round near the waters we guide. 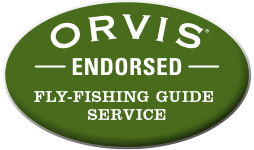 Orvis Endorsed Fly-Fishing Guide Service. Call or Email Us today! Wade Fishing Trips: pristine mountain streams & private access on the Wind and Bighorn Rivers. Including access on Shoshone National Forest and many Wind River tributaries near Dubois, Wyoming. Stillwater Trips: Fly fishing on scenic alpine lakes from boat near Dubois & Lander, Wyoming. Fly fishing instruction for all levels of experience and expertise including casting and drift boat lessons. Our guides are patient experienced teachers. 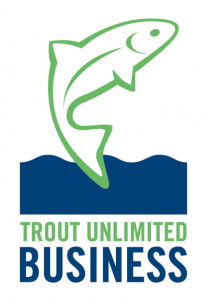 Credible Guide Service: CPR/First Aid certified guides, Special-Use Permits for ALL Guided Waters, Fully Insured Outfitter, Professional & personable local guides dedicated to conservation.